The Larapinta Trail is one of Australia’s most underrated experiences. There’s little doubt it’s one of the best trails Australia has to offer. 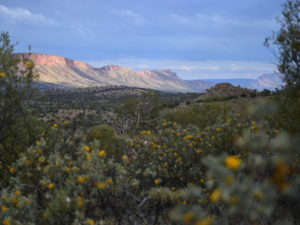 Stretching 230 kilometres between Redbank Gorge and Telegraph Station in the Northern Territory’s “Red Centre”, Larapinta traverses the rocky gorges and high ridges of the West Macdonnell Ranges. It usually takes 13 to 15 days to hike end-to-end, and its spectacular views at every turn will take your breath away. Like any trail, especially in Australia’s outback, there are a few things you’ll need to know before you start hiking. You might think 230 kilometres over 13 days doesn’t sound too hard, but I reckon you’ll be surprised. Section three (from Jay Creek to Standley Chasm) is only a 13-kilometre day, but it was one of the longest days of hiking I can remember. 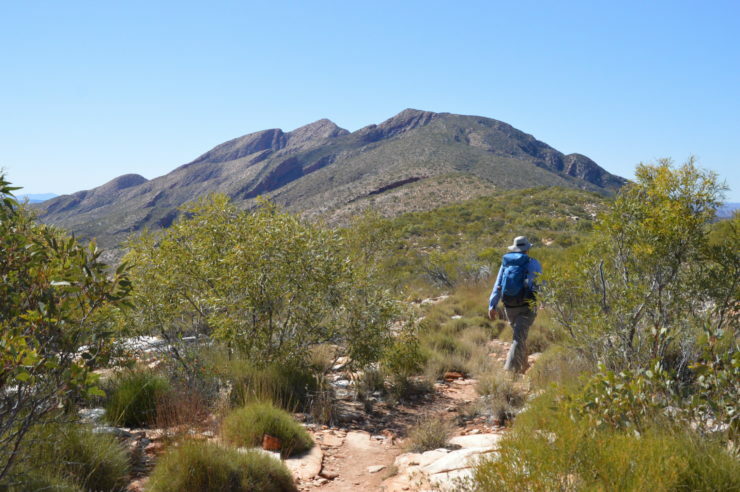 If you’re unsure of your capabilities, guided tours of the Larapinta Trail offer the luxury of taking in the highlights of the trail over fewer days. If you’re going it alone and hiking end-to-end, you may want to consider going for 15 (or even more) days. Either way, you need to train for months in advance, and not just for fitness but also agility. The Larapinta Trail will challenge you with plenty of rock hopping, not to mention the steep ascents and descents on loose rocky tracks. Don’t underestimate the hot days or the cold nights. 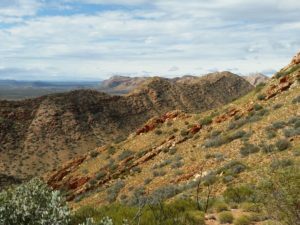 The best months to hike Larapinta are between May and September when average daytime temperatures are 20 to 27 degrees (Celsius) and at night they come down to 6 to 10 degrees. Even during these times, freezing conditions aren’t uncommon; nor are blaring hot days, which are particularly harsh on the more exposed sections of the trail. Make sure you pack clothes for all conditions so you can rug up at night and make sure you protect your skin from the harsh UV, especially on those exposed ridgelines. If you encounter unexpected high temperatures, plan an extended break during the hottest part of the day and make the most of the shade to cool yourself down. The Larapinta trail is rugged. I mean, like, really really rugged. I was a day and a half into my Larapinta adventure when I realised my hiking shoes weren’t up to the task. I’m not usually a hiker who has much trouble with his feet, but they already felt bruised from the near constant jagged rocky trail. A few others in our group didn’t make it through our trip because of blisters. You’ll need to think carefully about your choice of footwear for this one, and then make sure they’re well worn-in before you hike. Footwear isn’t the only worry, though. This type of landscape takes its toll on your muscles and joints too. Then there’s the red dirt, which will haunt everything you have with you for months, if not years, to come. Larapinta is no walk in the park. The landscape makes traversing carefully a necessity in order to stay safe. Unfortunately for me, it was a stupid careless mistake – tripping on a small rock because I was looking at my camera instead of where I was going – that cut my adventure short due to a torn meniscus cartilage. But that’s not even the only reason to take your time. This landscape is immense and its finer details are just as well worth taking in. Even a couple of days on the Larapinta Trail is enough to give you a case of what I like to call ‘wow’ fatigue – that feeling you get when you’re seeing and experiencing something so incredible that you just can’t quite comprehend it. You will constantly feel like you need to pause for a while and process it all. The Larapinta trail is famous for its critters. Okay, so I’m sure the first thing you’re thinking is snakes – especially if you’re a visitor to Australia. Your concerns are valid. The threat of snakes is very real, especially King Brown (Mulga) snakes. However, the snakes aren’t going to chase you down and kill you. They just want to be left alone. As long as you watch where you’re stepping and don’t try to harm them, you’ll be fine. The dingoes and their penchant for steeling food or even gear from our campsite was more of an issue for us. Waking up to a missing hiking boot wouldn’t make the best end to your adventure. The birds were pretty keen on our camp when there was food around, too. Keep an eye out for the wallabies and reptiles on the trail. They’re much less likely to raid your campsite and definitely won’t kill you, but they’re beautiful creatures to observe. The red dirt is addictive. The final and possibly most important thing you’ll need to know before you hike that Larapinta Trail is that you will come back, or you will yearn for it every day until you do. You might be a little bit glad when you finally wash the last of that red dirt from your hair, clothes and gear, but you’ll still be looking for your next hit. The Red Centre is a special place and you’ll feel different when you leave it. See photos from some of our Larapinta trail tours on our flickr page. Hiking The Larapinta Trail has definitely been one of the peak experiences of my life. I wouldn’t have been able to do it had I not gone with Inspiration Outdoors. I found the terrain challenging but not having to carry a heavy backpack made it do able. Our guides, Rachelle and Magic Mike were so supportive, encouraging and their knowledge of local culture and history was most interestingly presented. I really enjoyed the choice of music as we were heading to and from the Trail each day. To be able to return back to our accommodation, have a hot shower and then have a delicious meal waiting was wonderful. Obviously a tremendous amount of research went into this adventure and it showed, every aspect was seamless. Well done all concerned. I’ll be booking the Kimberley tour soon! Thanks Heather! We are so glad you enjoyed the experience. We look forward to showing you the Kimberley. What shoes were you wearing that”weren’t up to the task” and if you walked it again what would have been your focus for getting a more appropriate shoe/boot?